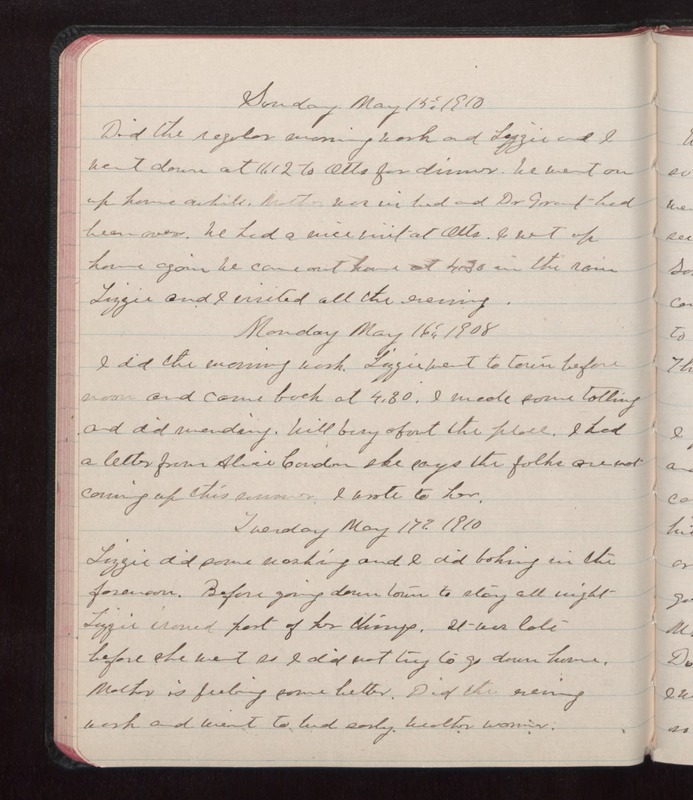 Sunday May 15 1910 Did the regular morning work and Lizzie and I went down at 11.12 to Otts for dinner. We went on up home awhile. Mother was in bed and Dr [Grant?] had been over. We had a nice visit at Otts. I went up home again We came out home at 4.30 in the rain Lizzie and I visited all the evening. Monday May 16 1908 [sic] I did the morning work. Lizzie went to town before noon and came back at 4.30. I made some tatting and did mending. Will busy about the place. I had a letter from Alice Condon she says the folks are not coming up this summer. I wrote to her. Tuesday May 17 1910 Lizzie did some washing and I did baking in the forenoon. Before going down town to stay all night Lizzie ironed part of her things. It was late before she went so I did not try to go down home. Mother is feeling some better. Did the evening work and went to bed early. Weather warmer.